This is what happens to me. I set out to make quick work of some inventory activity and I wind up drawn into the mystery. 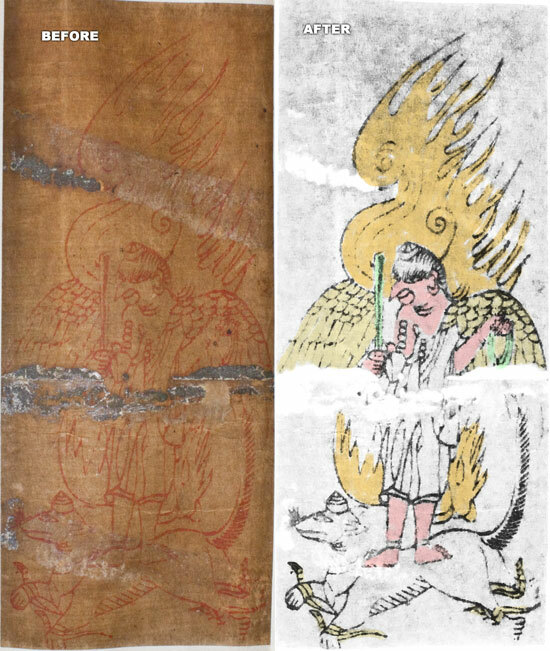 I photographed every old Buddhist print on a Japanese handscroll. Some are crystal clear and (it turns out) easily identifiable. Others, like the above left, are obscure. What the heck are we looking at? So I wind up on Photoshop, teasing out the image… adding a little color to clarify. Revision 7/17/11. Further research reveals this to be Izuna Gongen.